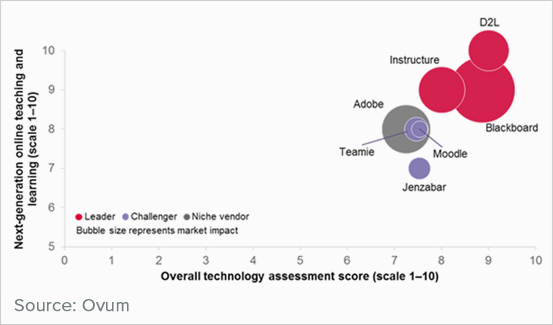 Industry Analyst firm Ovum, in their report published on 29th September 2015 - Ovum Decision Matrix: Selecting Online Learning Platforms for Higher Education 2015-2016, have featured Teamie as a Market Challenger and the only player from Asia Pacific that made it to the list. Ovum believes that the next 18 months will bring dramatic change to the OLP (Online Learning Platform) market. Download the key analysis of the report to learn more about the changing LMS landscape and customer requirements. The traditional classroom experience is no longer the preferred state, and higher education is moving away from its traditional emphasis on the instructor and replacing this with a focus on learning and the learner. During this next phase of LMS purchasing, institutions need to adopt more of a "blank slate" mentality to re-envision the best approach to empowering online learning for the next generation of learners. Again, it is impressive that Teamie, a smaller and newer vendor in the OLP market, quickly understood – perhaps even quicker than some of the more established vendors – that students want greater flexibility in how they access their courses, and made the Teamie platform accessible on a range of devices. The Teamie platform engages students via its social interface, mobile apps, gamification, and integration with commonly used applications such as Google Apps.